Vacation food is almost always exceptional and fun, first of all because it usually means restaurants. And at restaurants you don’t have to find recipes, shop, cook, and clean up afterward. Also, at restaurants each person can have exactly his or her favorite thing, eliminating the need for a menu compromise when appetites and preferences are in a standoff of Alamo proportions. So that’s nice once in a while, even in your hometown. And vacation food tends to be both abundant and right in step with how much energy is being expended, so a person’s body gets what it needs, uses what it gets, etc. But my biggest reason to love vacation eating is that while out of town I tend to be more adventurous, ordering things I might not order at home, trying to focus on local fare and customs and capitalizing on the spirit of adventure that my alone time with Handsome tends to inspire. On our tenth anniversary trip, we tried several local spots, some we’d visited before and others unknown to us. 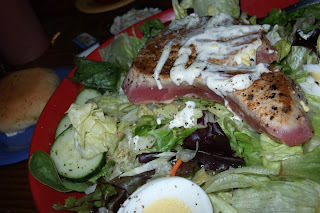 In Destin I stumbled on one menu item in particular that pretty much entered my personal Food Hall of Fame after bite number one: Seared Tuna Salad. The first thing I noticed was something this salad was not… It was not the typical entree salad made up of anemic iceberg lettuce, chopped too large then thrown apathetically onto a lukewarm coaster. 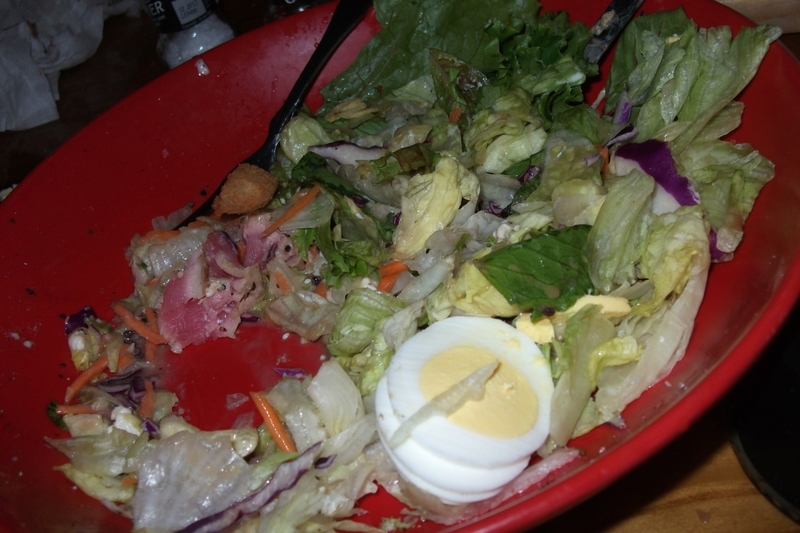 Being a frequent orderer of lots of restaurant salads, I am used to getting such a let down. But not that night. That night the salad bar was raised forever. Well, not that salad bar, but you know what I mean. Don’t you? After a nice long delay, during which time Handsome and I watched boats pass in and out of the harbour, the waiter appeared with our food. Showing great reverence for what he must have known was an exemplary dish, he lowered onto the table a platter as red as poppies in bloom. It was nearly as wide as my ribcage and freckled with those wonderful little frost droplets, indicating the platter itself had been chilled. I L-O-V-E it when people or restaurants remember to chill salad plates! The red porcelain was covered to within an inch of its margin with a deep bed of mixed lettuce greens. I saw at least four different kinds of lettuce in there, and it was all reduced to delicate little bite size pieces. Among the leaves, some deep forest green, some as bright as Granny Smith apples, others purple and bronze, I saw chopped ripe tomatoes, shredded carrots and cabbage, hard boiled eggs, fresh julienned bell peppers, cold, firm mushrooms, fragrant cucumbers, and really heavily herbed croutons. And tuna steak. The cold, crisp salad was practically genuflecting beneath a slab of meat about the size of two decks of cards and just a little thicker. It was, as promised, seared till almost blackened then drizzled with a zig zag stripe of their special mayonnaise-based dressing. Really garlicky and wonderful. I am a tuna steak convert! I have seen the freshness light and will forever now have trouble purchasing those flat little cans of the shredded precooked stuff. Which means, at upwards of ten bucks per pound and landlocked in Oklahoma against ocean freshness, I might not be having tuna very often. But that’s okay, this food is worth the wait. Back to the salad. It was delicious. Filled with texture changes and saltiness and creaminess and firmness. Hot and cold, crunchy then succulent… The tuna itself was as firm as a rib eye beef steak but tender enough to cut with the bossy edge of my fork. It was juicy and flaky at the same time. It had zero fishy taste, all protein and lusciousness. I started weeping at one point from Salad Bliss, and Handsome had to explain to concerned onlookers that it was our anniversary and I was feeling really sentimental. The funny thing about this lovely entree was that it just kept getting better. Every time I subtracted a bite from the poppy-red platter and stirred the remaining contents with my fork, the new combination of colors and textures was even more appealing than before. And when I requested additional dressing, the waiter brought me something different from what I expected but it was even more delicious! Then I added freshly cracked black pepper and ground up some sea salt on top of it all… W-O-W.
My goodness, the grittiness and flavorfulness of those two fresh seasonings will not soon be forgotten. I might be the last adult woman in North America to purchase her own salt and pepper mills, but it will be happening. Soon. I was physically and emotionally spent. Unable to consume the entire salad but completely satisfied, I snapped a few photos of the platter (can you hear Handsome groaning in disbelief across the table?) then pushed it away from my full belly. My body was replenished of all the calories and nutrients I had spent at the beach earlier in the day, and my mind was brimming with inspiration from this artistic expression of food. It was a good meal, one of the all time best, vacation or otherwise! Thank you, Destin Harbour, for the yummy memories.